Would You Eat Chocolate if the Cocoa Butter was Replaced with PGR: Polyglycerol Polyricinoleate? During a recent review of a new product in the yogurt isle, I noticed a new ingredient on the label, PGPR. 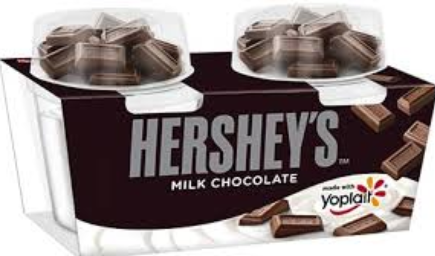 Hershey’s has partnered with Yoplait to bring us Hershey’s Yogurt Mix Ins. My first thought is, how much sugar is in these? Yet again, they are taking a healthy food like yogurt, stripping the fat away, adding a bunch of sugar and turning it into candy. The Hershey’s Milk Chocolate Mix Ins contains 30 grams of sugar. Of which 22 grams are added sugar. This equals 5.5 teaspoons of added sugar in this one food. This is a shot glass full of sugar. If you put this in your child’s lunch every day for school, this one product will add 15.5 pounds of sugar annually to their diet. Now let’s talk about PGPR. A quick survey of the candy aisle at a local drugstore revealed PGPR is in most chocolate products: Reese’s, Mounds, Kit Kat, Cadbury Dairy Milk and all of the Hershey’s products, and many others. What is PGPR? On the label you will see it listed as an emulsifier. Polyglycerol polyricinoleate is a yellowish, viscous liquid comprised of polyglycerol esters of polycondensed fatty acids from castor oil. Now, doesn’t that sound delicious? "Cocoa Butter is Being Replaced with PGR: Polyglycerol polyricinoleate – you cool with that? " You’ve likely heard of soy lecithin before. It is really the darling of the food-processing industry. It is hard to find a packaged food that doesn’t contain soy lecithin. Soy lecithin has long been used as an emulsifier in chocolate. Over the past few years, the cost of soy lecithin has been increasing, as the demand for the non-GMO version of soy has increased worldwide. So, the chocolate manufacturer’s way around this more expensive ingredient is to find a new less expensive emulsifier, and that’s where PGPR comes in. In addition to using PGPR to replace soy lecithin, in 2006 chocolate manufacturers began replacing the expensive raw ingredient cocoa butter with PGPR in their recipes. PGPR replicates the mouth-feel of cocoa butter and is more shelf stable than cocoa butter. This reminds of trans fats – where trans fats were used because they mimicked the mouth feel of creamy fats, while a the same time they were highly shelf stable. PGPR is made by the chemical giant Palsgaard. From Palsgaard’s website, “Cocoa butter is an expensive raw material for chocolate manufacturers. By using PALSGAARD 4150 (which is PGPR) the chocolate recipe has lower costs in terms of less cocoa butter…” In other words, PGPR is a way for chocolate manufacturers to get around the hassle and expense of actually putting chocolate in their chocolate. Big Chocolate has historically tried many ways to reduce cocoa butter in its products, not just with emulsifiers, but also with other oils, including partially hydrogenated palm oil. In the United States, when a chocolate bar doesn’t include cocoa butter or includes other oils, it can’t actually be labeled chocolate. In 2007, the Chocolate Manufacturers Association, of which Hershey’s is a member, petitioned the FDA to change the legal definition of chocolate to enable producers to use partially hydrogenated vegetable oils in their products in place of cocoa butter. My advice to you when choosing chocolate is this – if you see ‘soy lecithin,’ or, ‘PGPR,’ or, another of Palsgaard’s emulsifiers that will likely be used in manufacturing soon called ‘Lecithin YN’ which is Ammonium Phosphatide, put the product back. Choose quality chocolate, made from companies who choose not to adulterate their chocolate with additives and emulsifiers. Did you know the "Nutrition Facts" shown on food labels are just a bunch of numbers grabbed from the thin air? Lots of food companies manipulate those numbers to their own advantage. I have been looking up whether the "Nutrition Facts" on food labels are facts or fictions, but I have very few evidence to show any of the listing has facts to support it. One example is pinto beans. On the fns.usda.gov site, it shows 86g of pinto beans contains 8g of dietary fiber and 8g of protein; but, on Diamond brand of pinto beans, it lists 36g of pinto beans contains 14g of dietary fiber and 7g of protein. That variation is a lot more than the 20% allowed for deviation. So, it appears to me the nutrition facts is just a bunch of numbers grabbed from the phone books. 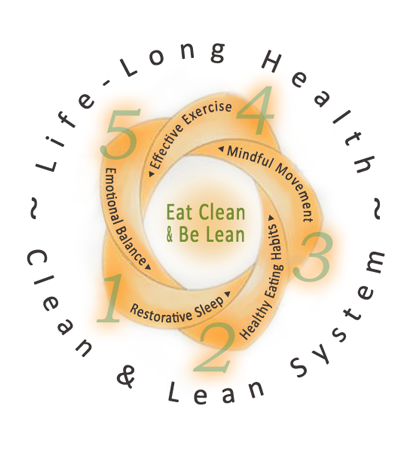 "The Clean and Lean Revolution will set you on the path towards life-long health. Angela is so knowledgeable and makes choosing healthy options everyda..."
"The Clean & Lean Revolution addresses health from so many important angles, covering areas of nutrition, movement, mental and emotional well-being, sl..."
"Thank you for your support and expertise. Since I joined the quarterly Challenge, I have lost eleven pounds in eleven weeks. More importantly, for th..."
"Hi Angela..Just wanted to tell you thank you so much for all that you do. So far I am down 22 pounds and feel better than I have in a long time. I hur..."
"I’ve lost 120 lbs in 13 months!! I started working one on one with Angela last year. Then I transitioned over to the membership to use as a maintenanc..."
"My total weight lost since april 2013 is 45.3lbs.. still got alot more to go but I will get there one step at a time! I am focusing on moving more eac..."
"I’ve lost 50 lbs in 6 months!..." "I lost 5 lbs the first week that I removed gluten. I was hoping that gluten wasn’t an issue for me. After the program I tried bringing gluten back in ..."
"I’ve lost 47 lbs since Jan 1st and 8 dress sizes. This is the only plan that I have ever stuck with. I feel like I am not dieting. The weight is just ..."
Already Working the Clean & Lean System? Group Program Not Your Thing? Work One on One with Functional Medicine Nutritionist Angela Pifer! What Are They Injecting Into Your “Natural” Chicken? Are Gummy Vitamins Harming Your Kids?